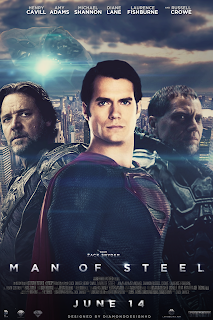 Sunday night I saw The Man of Steel with a buddy. It was awesome! While a lot of the fight scenes were a bit over the top with how much destruction to the city Superman creates, it sure was fun to watch on the big screen! It just seems like Superman would have tried to take the fight away from the city - but then that wouldn't have been as riveting to watch now would it? Besides the amazing action in the movie, and it was so good, there was a lot of great storytelling going on too. This movie made use of flashbacks really well to fill in the back story. The way they would jump back in the timeline to show you how Clark grew up to be the man he is worked really well. You got to get to the exciting part of his adult life pretty quick, and still go back and see big important moments of his childhood that shaped him. I'm not sure why it worked so well, but the people making this movie knew what they were doing. This is easily the best Superman movie to date. It was a long movie, but they used the time on the screen well. You get a lot of story in this film. It starts all the way back before Kal-El (Superman) is born and you really get to see his world on the brink of its destruction. The CG was amazing. I muttered "wow," and "dang" quite a few times as I was really taken aback by the stunning stuff I was gazing upon. So even though at times the movie went a bit over the top, it was a blast and the story telling was really good. I can't wait to see this film again! Have you seen it? What did you think? Was I way out of line calling this the best Superman film to date? Is that blasphemy? Tell me about it! Leave a comment. Thanks for stopping by.